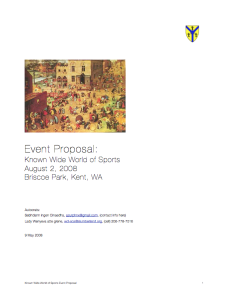 You have an idea for the main event activity, perhaps, but what else is going to happen? Is there going to be a tourney? Rapier, Heavy, both? Children’s activities? A feast, quest, Court of Love, A & S competitions, archery, classes? Is your event going to be part of one day, all one day, two days, more? This is where the advice of your event steward team can be especially valuable. No event can have absolutely everything, you need to decide what you want to concentrate on. Take a look at how many people we have, what they are presently interested in, where most of our out of town guests are likely to be drawn from, and other factors like the season, particular features of the site, and so on. Come up with at least one major and two minor activities–for instance, a big feast, a small tourney and some informal A & S classes. Or, perhaps, a war, some rapier classes and a potluck dinner. This can be varied ad lib depending on the time available, but try to keep things varied, interesting and maybe just a little nonstandard –it’s nice to be able to offer people something out of the common ordinary event formula. This is a good time to start drawing up a proposal for the funds that you may need to run this event. This will give you a better focus as to what activities you really want to have at your event. Will the A & S need supplies? What is needed for the planned children’s activities? What is your goal to complete your feast in? Will you be giving prizes? It’s time to assemble your event team. Again, your event steward team can be a great help in deciding what mix of assistants will work well for your particular needs. Take a look at the Event Report Form; what positions will you need help in coordinating? These are people whose work is mostly before the event actually starts, or behind the scenes while it is going on. These include people like your head cook, dishwashers, gate keepers, and generic laborers who set up erics, haul tables and chairs, put up day shades, fetch water, set up signs, unload cars, and generally make themselves more valuable than gold. These are people who will be in charge of an event activity or responsibility. Examples are the marshal in charge, the field herald, the person in charge of any A & S activities, Pied Piper, and so on. First, talk to the various Wyewood officers. If you are going to have a tourney, speak with the marshal. Is he going to be available that weekend (don’t take that for granted! ), and if not, what other warranted marshals are locally available? The same applies in their own fields to the herald, the A & S minister, and so on. Each officer should get first crack at being the responsible person at the event, but they may not always be able to, so make sure to ask. If Royalty, or their representatives (Patrons / Baronage), will be attending, ask them if they would be interested in holding court. If you are going to have a feast, you need a head cook. It is best for a novice event steward to work with a veteran head cook, and vice versa. Again, confer with your assistant event steward, the seneschal and previous event stewards about choosing a head cook if you don’t already have one in mind. Don’t be afraid to ask for references, this person is going to be responsible for a lot of expenses and more than one event has gone over (or not) on the strength of the feast. Go over Worksheet B, the Feast Planning Worksheet, with your cook. Now is the time to get out Worksheet C and Worksheet D.
As people tell you they are willing to act as support or activity personnel, pencil them in, too. Keep in mind that life happens and things may change; people can’t always be 100% sure of their commitments several months in advance. If you are having difficulty finding enough people to fill out your event steward team, or can’t find the right people for the positions you want, it may be that your idea needs some work still. It could be that Wyewood is not ready at this point for the type of event you have in mind. It is better to discover this now rather than later. So here you are–you have assembled a remarkable amount of information in your trusty notebook. You have a line on a good site, you know how much it’s going to cost us to hold the event you’re thinking about, you’ve got a general plan of what we’re going to do there, and you have at least some of the folks lined up who will help you make it happen. Now it’s time to sell your great idea to Wyewood. You may think, but I’ve already talked to all these people, and they know I want to do this, isn’t that enough? In order for the branch to put on your event, the decision has to be made to spend branch money on it. Now is the time for you to go to take a long look at the Wyewood Financial Policy. It may not be exciting reading, but familiarity with it is a must for a prospective event steward, particularly Sections VI and VII. There you will see that in order to get an event approved by the branch, you must submit “a written description of the event, including activities and proposed site, an Event Budget Worksheet, detailing the estimated income and expenses expected for this event, and a list of people that have committed to perform the necessary functions to put on the event, including the approval of the officers responsible for the activities proposed at the event. That is a long way of saying “The contents of Worksheets A, B, C, and D”–which you have already done. You will see that there is yet another form to fill out–that is the Event Bid Form. This is a condensed version of all the information you have already gathered on your worksheets; it’s easier to refer to in a meeting, being only one sheet. Fill out the bid form, make several copies, and tell the seneschal you have an event proposal to bring to the next officer’s meeting.